In 2015, William won 3rd prize at the Queen Elisabeth International Violin Competition! Watch the video of his performance here. Also in 2015, William was interviewed by The Violin Channel. Find out more about William by visiting his website. William appeared on Show 194, recorded in March 2009, at age 16. 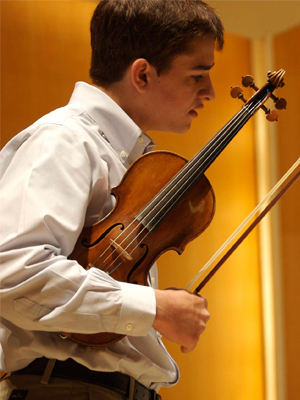 William Hagen (violin), 16, for the past six years has traveled from his hometown in Salt Lake City to Los Angeles each week for lessons at the Colburn School, where he studies with Robert Lipsett. He has appeared seven times with the Utah Symphony since the age of nine, and as a soloist with several other orchestras including the Jacksonville Symphony and recently the Albany (NY) Symphony. Diagnosed with juvenile diabetes at an early age, Will has been actively involved with fundraising concerts for the Juvenile Diabetes Research Foundation. Currently a sophomore at East High School in Salt Lake City, he plays for the varsity baseball team and has hit 23 career home runs.